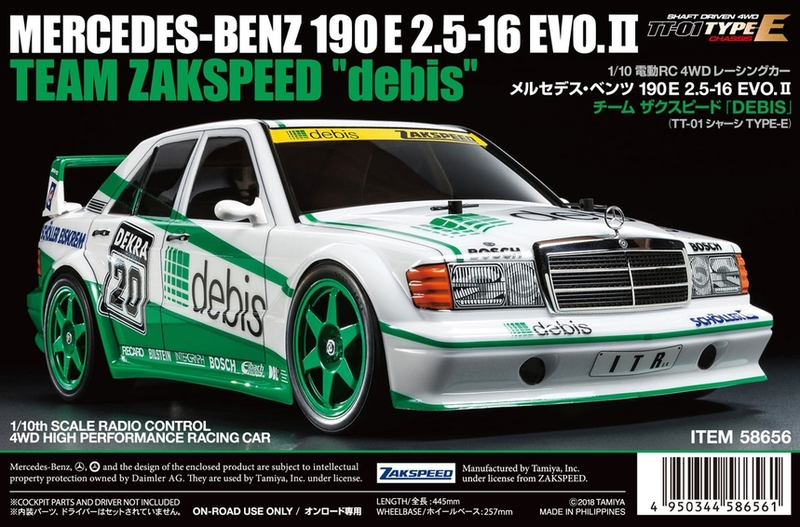 Home Shop Radio Control Cars 1/10 4WD Shaft Drive On Road (TT) Rc Mercedes-Benz 190E "Debis"
This is a classic Mercedes race car from the early 1990’s. It replicates the iconic 190 E 2.5-16 Evo.II. The livery in this kit faithfully replicates the colors of the Team Zakspeed car which ran in the 1991 DTM. Of special historical racing note; in races 6 and 7 of the season, the no.20 car was piloted by a young Michael Schumacher, who later went on to win 7 Formula One World Championships. The main sponsor of the car was Daimler-Benz’s now-defunct group company Debis. •	1/10 scale R/C model assembly kit. Length: 445mm, width: 184mm. •	Body is made of durable polycarbonate, with separate molded mirror, wing and grille parts, as well as a plated Mercedes-Benz 3-pointed star emblem. •	Marking stickers included to recreate sponsor logos and numbers on the No.20 car. •	6-spoke wheels are molded in soft green and paired with slick tires. •	The TT-01 Type-E chassis features shaft-driven 4WD system and full independent suspension that offers easy handling and great customizability. •	Requires: R/C equipment (transmitter, servo), battery pack and charger to complete and Tamiya PS spray paint.